Join us for the 3rd part of our NODUS Fall 2017 Concert Series: Sound Image and Design! Audiences will be treated to a performance by FIU’s NODUS Ensemble and panel discussions based on works by Chong, Garcia, Pisaro, Schankler, and de la Vega, Warren, focusing on cutting-edge Art music that blends visual art and/or architecture and design. Panel members Orlando Jacinto Garcia, Eric Goldemberg, Jacek Kolasinski, John Stuart, and Jacob Sudol will comment on the intersection between the arts and the works being presented. 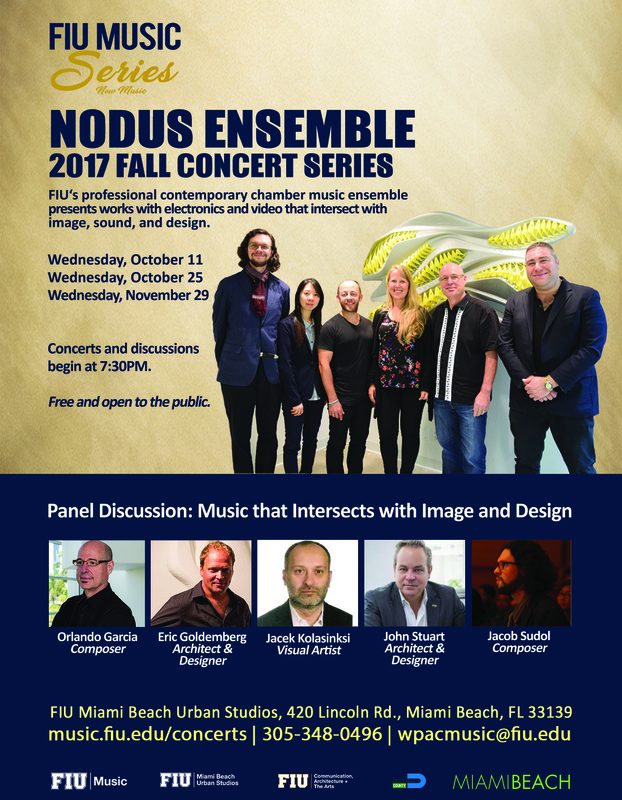 NODUS is the professional contemporary chamber music ensemble in residence at Florida International University in Miami (FIU). Specializing in the cutting edge Art music of our time, the makeup of the ensemble varies for each concert depending on the works being presented. The ensemble’s repertoire includes recent music by composers from around the world, works written specifically for the ensemble, and works with electronics and/or video.